We know that you work hard for your money and often a tax refund may be the biggest check you get all year, so we’re here to let you know how the new tax reform legislation may affect your tax refund. The new tax law is the largest piece of tax reform legislation in 30 years and was signed into law on December 22, 2017. For most people, these tax changes impact tax year 2018 (the taxes you file in 2019) and not tax returns you’re filing now. Overall, the changes associated with the new tax law may lower taxes for individuals and small businesses. If you claim the standard deduction you may see less tax liability in 2018 since the new tax law nearly doubles the standard deduction amount. Single taxpayers will see their standard deductions jump from $6,350 for 2017 taxes to $12,000 for 2018 taxes (the ones you file in 2019). Married couples filing jointly will see an increase from $12,700 to $24,000. These increases mean that fewer people will have to itemize. Today, roughly 30% of taxpayers itemize. Under the new law, this percentage is expected to decrease. If you claim itemized deductions you may see fewer tax deductions that lower your tax deduction especially if you live in a state with high property taxes since the new law limits the amount of state and local property, income, and sales taxes that can be deducted to $10,000. In the past, these taxes have generally been fully tax deductible. If you are self-employed or have an S-Corp or partnership you may see lower tax liability which may increase your refund since the new law includes a 20% deduction for incomes from certain type of “pass-through” entities and almost doubles the amount small businesses can expense when they purchase business equipment from the 2017 Section 179 amount of $510,000 to $1,000,000. The IRS is also working on revising Form W-4 to reflect additional changes in the new law, so employees can update their withholding in response to the new tax law changes. TurboTax has you covered with TurboTax Tax Caster so you can estimate your tax liability for 2018. Stay tuned for TurboTax updated W-4 calculator so you can calculate your personal allowances for your withholding from your paycheck. TurboTax has you covered and will be up to date with the latest tax laws. If you have more questions while doing your taxes, you can connect live via one-way video to a TurboTax Live CPA or Enrolled Agent to get your tax questions answered. TurboTax Live tax experts can even review, sign, and file your return. TurboTax has also launched a new Tax Reform Calculator educational tool. The TurboTax Tax Reform Calculator, is a fun, free visual interactive that should be used as an educational tool that allows you to easily get a deeper understanding of how the new tax law impacts taxpayers with similar situations as you by providing the federal average tax outcome based on actual aggregated, anonymized TurboTax data. Already filed? Click here to sign up to talk to a CPA or Enrolled Agent to find out how tax reform impacts you. The Standard Deduction nearly "doubles" but the personal exemption gets eliminated. Doesn't that mean that certain families will end up having more taxable income? For example, we have $19k in itemized deductions and $8k for two exemptions in 2017, for a total reduction of $27k in taxable income, but with new "tax cut" plan, isn't my income reduced by only $24k, the new standard deduction? Please explain to me how this is a tax cut, if my taxable income is going to be higher. The biggest surprise for most people will be that they won't get a refund next year. While the intent of the reform was to reduce taxes for most people, the decision to change the federal withholding tables in 2017 is going to kill your refund. Most people will owe less taxes, but they will also have less withheld from their paychecks. This means you get more money now, but don't expect to get more money in your paycheck today AND get a big refund at the end of the year. I think this is going to catch a lot of people off guard! Itemized deductions have not been eliminated. There are new caps on some, like state and local income and property taxes. Your itemized deductions may or may not be affected by the new $10,000 cap. With all due respect, this post is fairly useless. Boils down to "depending on your situation, you might pay more or less taxes for 2018." I'm trying to calculate if we need to adjust our withholdings this year. The IRS calculator is unfriendly, as you need to know exactly what you filed. I tried TurboTax's Taxcaster, but for some reason it doesn't pull in the tax information I provided 3 months ago, and expects me to go dig up the same information. This should be easy for TurboTax and for your customers. Why isn't it? I think it unfair for IRS to require qtrly estimates based on 100% of current year tax (in my situation), when it is August and no forms have been released yet. So I have to rely on your taxcaster (serious errors), or the 1040ES in my desktop 2017 TT premier. so, your taxcaster does not produce the same income tax amount as your 1040ES, both based on 2018 tables. your 1040ES matches to the dollar my own calculation using tables. your caster is significantly higher, using multiple scenarios. since black box, no way to tell what your programming error is in caster. moving to alt min tax, using your 1040ES, I have to calculate it myself and type it in. fine, but all we have is 2017 forms, and rules have changed. so I used own program and came very close to your caster, but only if I moved all business income to another line item. in your caster, if one inputs business income, the alt min tax increases by a HUGE amount, w/ no other changes. since business income is taxed the same for regular and alt min, should be no change (unless the new 20% deduction is an addback). your new alt min is near 50% of the business income. something badly wrong. Finally, the rules for 20% deduction for QBI are not yet out, but I read that if income is over $400k, one loses the 20% deduction. your caster ignores that, because I put in all my data, and it forces the 20% deduction on any form of business income. there is no way around it, other than to not report the business income, move it to other. this causes SE tax to be wrong as well. your caster has flaws. as to the 3.8% obama tax on net investment income. your 2017 program compares the modified AGI - $250k to the net inv income, and takes the lower. it is unclear for 2018 if we are allowed the deductions from net inv income, such as inv fees, state taxes and inv interest (all sizable). the 1040es, and the caster, both assume zero deductions (cannot tell if program error or the law changed), but they simply take AGI (not allowing the std deduction) and multiply by 3.8%, overstating the NII tax, at least compared to 2017.
fortunately, the 1040ES in the desktop 2017 program seems to cover the new scenarios, except for the inability to calculate the new alt min tax and the lack of clarity for how new tax law treats calcuation of NII for that tax. To estimate what your refund will look like, you can use our Tax Caster available online or on mobile app. For a limited time only, we are offering a free 15-minute consultation with a tax expert that can help you better understand tax reform, and how the new tax law changes could affect you. 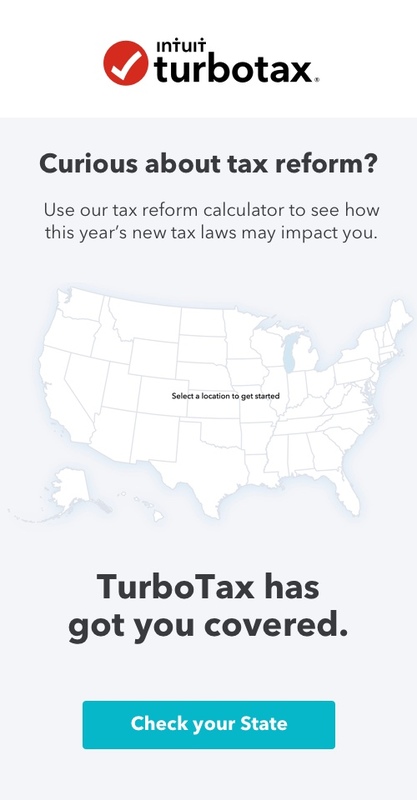 Click here to Learn More & read up on our Tax Reform hub too: https://turbotax.intuit.com/tax-reform/. The taxcaster Gabi mentioned will ask for your 2017 information and will forecast your 2017 tax due or refund, BUT it also includes a column to the right that shows your 2018 tax liability based on the same information. Until TurboTax updates the taxcaster for 2018 you can enter your 2018 estimates, ignore the 2017 amount, and use the 2018 column. As a bonus you can see what your tax would have been if the tax law had not passed. The current Tax reform does not lower taxes for all. Instead it simply shuffles the the tax burden. For some, it means a higher tax burden for others not so much. A taxpayer filing a joint return with 5 dependents, who does not itemize likely sees an increase in taxable income from 2017. Why? Because in 2017 each dependent was worth $4050 in exemptions or in this case $28,350...then add to that the Standard Deduction for Married Filing Joint ($12,700) total deductions = $41,050. This year it's a straight up $24,000. What about the married couple with no dependents. Last year they got $8,100 for the two exemptions add the Standard Deduction ($12,700) there total deductions are $20,800 for 2017. During the current year their situation improves because the Standard Deduction is $24,000.